You can bring your Mevo into your Livestream Studio production as a Remote Camera. This would allow you to use more than one Mevo camera in your production at one time if you want. When Mevo is on your network, Studio will automatically detect it. There is no need to open the Mevo app to enable it as a remote camera (earlier versions of Mevo required this additional step). You must be on Studio version 6 and Mevo version 1.13 with the latest firmware. These are not compatible with older versions and do not support this workflow. 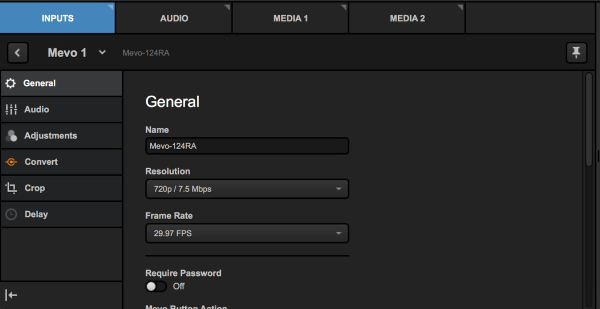 Many of Mevo's basic settings in the Mevo app are configurable directly in Studio in the General tab. This includes the camera's name, resolution, frame rate, password protection, Mevo button's setting, auto turn off, auto-wide on app disconnect, and speaker and LED ring settings. 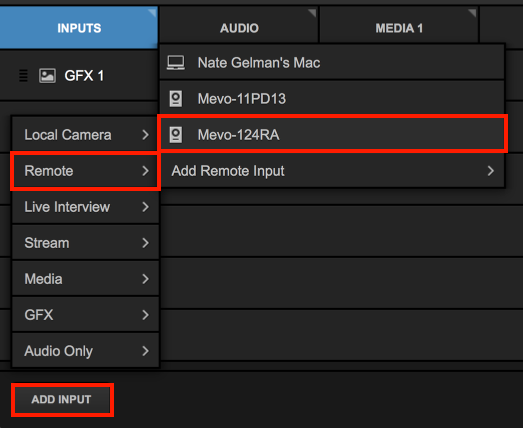 While Mevo is being used as a Remote Camera in Studio, you may still live edit your Mevo shot in your Mevo app. 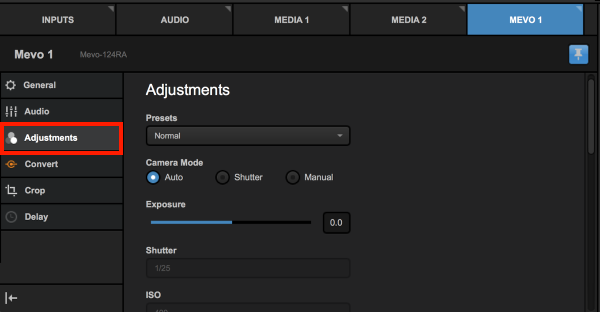 This includes features such as face detection and live follow, but please note that while these features are in use, you will not be able to change Mevo's shot via Studio until you cut to a generic crop or a wide shot. Selecting 1080p / 15.0Mbps will disable all Camera Assistant features (Face Detection, Live Follow, Auto Pilot, Static Shots). Panning and zooming via the Mevo app is also disabled, but you can cut/crop your shot or use the crop features inside Studio.